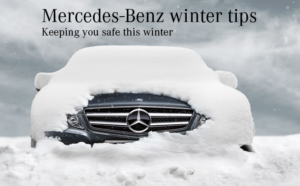 Keeping you & your Mercedes-Benz Safe this Winter. Winter can be a challenging time for drivers, so it’s crucial to get planning early. You should always put safety first and allow extra time for your journey – but what else can you do? Ensure your Mercedes-Benz is ready to tackle wintry roads with our list of must-haves for navigating cool conditions. Defrost your car – Perhaps the most obvious one, but it could be the most important. Make sure your vehicle is completely defrosted before you hit the road, and ensure the visibility from your vehicle is as high as possible. Reduce demand on batteries – Leaving lights, display screens and other features switched on unnecessarily in the cabin can be a strain on the battery. Turning them off as soon as you’re done will help in preventing any sudden losses of power. Wash your Mercedes-Benz regularly – Keeping your car clean ensures dirt doesn’t accumulate and damage the paintwork of your vehicle. Fill up your cooling system with antifreeze – Antifreeze is essential to stop your cooling system from freezing during very cold weather. Make sure it’s topped off frequently to keep everything running smoothly. Clean headlamps and windows regularly – A clean car is a safe car, as your vision won’t be compromised and there’ll be plenty of light emitted from your sparkling headlights. Keep windshield and headlamp washer fluid full – Keeping washer fluids full means you’ll have plenty to clean your windshield with, making sure your vision is always as good as it can be. Check your tires – Another important one: tires are the only thing standing between you and slippery surfaces, so ensure their tread is at least 3mm and that they’re not too worn. Consider Mercedes-Benz Cold Weather Tires – It’s a good idea to invest in some tires that are really designed for cold climates. They’ll stick to the road more easily and efficiently, removing some of the worry from driving in poor conditions. Keep your distance and watch your speed – Since braking takes far longer on slippery roads, keeping a safe distance from the car in front is a must. Always make sure you’re in control of your speed too, and never go faster than feels comfortable – or the speed limit. Avoid sudden acceleration and braking – Your control levels will be much lower on icy roads, so take things slowly to keep you and your Mercedes-Benz safe throughout the season.